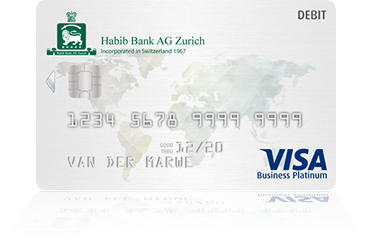 With the HBZ Platinum Business Debit Card you can always expect the best. This internationally recognized Visa premium card is accepted at over 29 million merchant outlets and 1.5 million ATMs in more than 200 countries and territories worldwide. Control - Separation of personal and company expenditures. Convenience - Simple access to funds at home or abroad and unsurpassed acceptance. Peace of Mind - (i)Secure POS transaction with proven chip & PIN technology. (ii)3D secure protection for e-commerce transactions. And (iii)Transaction alerts (SMS). Small businesses, entrepreneurs, independent contractors, and sole proprietors. Business owners looking to separate their company expenses from their personal expenses, and track business expenses. Businesses that want a convenient and easy-to-use payment method for goods and services. Businesses who want greater savings to manage their costs more effectively. Purchasing flexibility: You no longer need to depend on cash or checks. The Visa Business card can be used for your company’s expenses including office supplies, furniture, computers and software, travel and entertainment, and more. Online convenience: The Visa Business card makes it easy to purchase goods and services electronically. Save time by buying office supplies and booking your business travel online. Valuable services and protection: You’ll benefit from Visa services such as travel and medical assistance. Emergency cash and card replacement are also available. Worldwide acceptance: The Visa Business card is accepted at millions of locations worldwide and throughout the Visa global ATM network. Take advantage of your HBZ Visa Platinum Business Debit card. Automatic rom Upgrade upon arrival. $25 USD food or beverage credit. Discounts and Privileges at Avis for all Visa cardholders. Avis Car Rental operates one of the world’s best-known car rental brands with a truly global footprint. Prepare before you leave home. Please note Your International SOS contact phone number listed below. Call International SOS Assistance Centre for free pre-travel information and advice. Download our brochure about Your International Medical & Travel Assistance Services. When paying with your Visa Platinum card, you may benefit from Purchase Protection for lost, stolen or damaged goods purchased. Use your Visa Platinum card to pay for your purchases and items purchased may be eligible for the benefit of Extended Warranty. This benefit automatically doubles the original manufacturer’s warranty for selected items purchased with your Visa Platinum Business Debit card. GCAS exists to provide our Visa Platinum cardholders with the world-class customer service that they deserve. Providing essential services when they need it most, GCAS adds genuine value to the Visa Platinum Business Debit cardholder when they travel. Lost or stolen card reporting. Emergency cash disbursement up to US$5,000. A number of special offers are provided throughout the year. Check this section from time to time. Visa Explore App - one access point for all Visa global, regional and local offers for our regions' card holders. With the Visa Explore mobile app, Visa cardholders can find the latest Visa offers and promotions overseas or nearby - from travel deals, to dining, entertainment, shopping and other lifestyle-related privileges - personalized according to their interests. Using GPS, the Nearby feature can show the offers available around the Visa cardholder. Visa cardholder can even filter these offers by the kind of experiences they are looking to avail. Visa cardholders can also find out locations of ATMs that exist around them at the click of a button. Note: Offers vary over time. Visit www.visamiddleeast.com/visaexplore for Terms & Conditions. Have a better control on your card activities. Click HBZweb to register online for Internet banking service. And click HBZ App to download/install HBZ Mobile App for your apple or android smartphone. Keep a check of your account balances and transactions via sms intimations. Subscribe to HBZgsm banking that delivers account information to your mobile phone via SMS (Short Message Service). This event-based system sends account information of your mobile based on the defined rules to receive Account Balance information, Transaction details or other inquiries. Avoid hassle and charges for receiving your account/card statement physically. Subscribe to HBZ eStatement to receive your account/card statement instantly via secure email, free of charge. HBZ eStatement is sent securely to the customer’s subscribed email address, as a password protected PDF file.